NRI (non- resident Indian) Mr. Chandru Butani's son Major Raj Butani MD of the US 2nd Brigade return from Iraq after providing medical care to U.S. and Iraqi soldiers and civilians. He departed his home station in Honolulu in June 2004, arriving initially in Korea to join his unit for pre-deployment training. His unit reached Kuwait in August 2004 for some additional training and to receive their vehicles (which were shipped by sea), and arrived in Ramadi, Iraq in the Al Anbar province later in August. My duties includes routine primary careeverything from sports and training-related injuries to medical illnessesas well as urgent care for combat-related traumas and casualties. 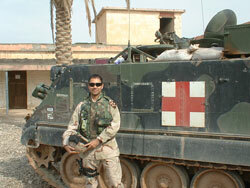 I work with a team of medics, a physician assistant and other physicians stationed on our Forward Operating Base. When he isnt working, Butani contacts his wife at least a couple times per week via e-mail and or phone. We manage to keep in touch pretty regularly, Butani says. They have built up reasonably good Morale-Welfare-Recreation internet and phone centers on the bases here with reasonable calling rates, but the lines can get pretty long during peak hours, and there are time limits on phone calls when there is a wait. It works well when I'm calling Hawaii, since the time zone is such that it's off-peak for most people. Internet access is decent, although of course the servers go down every so often and other things happen which may temporarily affect service, such as the underground cables relaying the signal may be run over by a construction bulldozer, etc. Butani, who completed the six-year B.A./M.D. combined degree program with Lehigh (earning a bachelor's degree in premedical science) and the Medical College of Pennsylvania (now part of Drexel University) in Philadelphia. 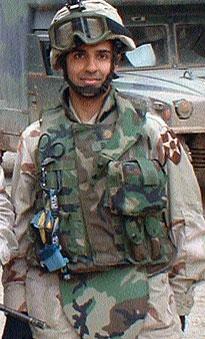 Before his deployment to Iraq, Butani worked as an Army gastroenterologist at Tripler Army Medical Center in Honolulu, Hawaii, where he lives with his wife, Mona, a dentist. They could see the buses rolling out across the airbase tarmac but were not sure their soldier son, Iraq returnee Major Raj Butani of the US 2nd Brigade, was in one of them. But Chandru Butani's account of his son's experiences is immediate, raw, throbbing and is perhaps the first authentic, first-hand account by an Indian American of life with the US army in Iraq. Butani and his wife had heard from their son sparingly, once in a while when he could send an e-mail or talk over the phone, but army regulations did not allow him to give much detail. Butani explained why they had been 'on the racks' all the while. Raj had been posted in Ramadi, which forms part of the Sunni Triangle, an area with the highest resistance to US presence. "In the first phone call after the convoy reached Ramadi (a three-day travel from camp Hovey, Kuwait), Raj mentioned that there was a bit of tension, as they were travelling on a two-way road and he sounded quite concerned about insurgents and IEDs (improvised explosive devices). Butani Sr read from the first e-mail his son had sent out of the makeshift e-mail centre inside a tent: "There were long, long stretches of desert sand or gravel where we would 'stage', or park our vehicles in pitch darkness for overnight rest. I could sleep in the litters in the back of the ambulance, but due to the heat it was easier to get out my 'woobie' (like a thin camouflage blanket), lay it out on the roof and sleep on top of the vehicle. "I would get a few hours of sleep, and then start the next day. Lying there and looking at the hundreds of other vehicles in the middle of the desert night, looking up at the moon and the night sky somewhere in the middle of Iraq. The whole thing seemed so unreal. "I remember thinking 'Could I ever have dreamt of this sitting at a lecture or on rotation duty at the hospital?' Probably not, but there are many other things in my life I probably didn't see coming, and I don't remember regretting any of them. In the end - hopefully - this will end up being another of those things. I also remember thinking: hope I don't roll over the wrong way, fall off this tall vehicle and break my neck or bust my head. Luckily, that didn't happen either." Butani's father said, "One of the worst incidents happened when his physician assistant and closest friend, who shared room with him at the Ramadi Base, was slain when an IED blew his vehicle to smithereens. I remember Raj being devastated for several weeks. Being his closest friend, he read out the eulogy, and he completely broke down. "All the while that Raj was in Iraq, we were watching every possible news story, trying to guess what really was happening out there. Raj himself could not tell us much due to military information rules. "As you can imagine, prayer-time increased proportionate to our anxiety levels, and the extended family and friends were all involved. I think it must have gotten too much for our deities in the end," a relieved Butani Sr said with a happy chuckle. "In early July, we heard that the 2nd Brigade would finally wind up and return home. As the days inched closer, anxiety peaked. And Raj had to remain incommunicado. But finally, the family reached Colorado Springs one day, and saw the plane touch down, the buses with tinted window glasses roll out with the returnee patriots and then in the end, bring them to a large gymnasium for the long awaited, chaotic reunions. But then, Raj was not there! "Then we realised that he was being brought in an army limousine, along with some other officers... rank has some privileges, you see," smiled a relieved Chandru Butani.